Limestone is one of a variety of natural stones used for building as well as flooring, fireplace hearths and counter tops. The earthy look of limestone adds to the beauty of your home and lasts for many years when maintained and taken care of correctly. Similar to other natural stones, limestone is porous and absorbs stains. In order to effectively get a stain out of limestone, you must remove the substance from the surface and draw it out of the stone. Soak up any existing stain substance with a clean cloth. Combine four drops of mild dish-washing detergent and 1/2 gallon of warm water. Wash off the surface of your limestone with the mild soap solution to remove as much of the stain from the surface as possible. Rinse with a damp cloth before patting dry. Remove the stain from beneath the limestone surface with a homemade poultice. Place 1 cup of diatomaceous earth in a bowl. Create a paste-like substance by drizzling on water for oil stains, hydrogen peroxide for food or wine stains and ammonia for mold and mildew stains. Scoop out the poultice paste with a spatula and spread it over the stain on your limestone. Continue to apply paste until the stain is completely covered with a 1/2-inch-thick layer of poultice materials. 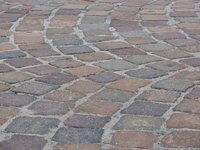 Allow the poultice to remain on your stained limestone until it dries completely, drawing the stain out of the stone as it dries. Slide the spatula underneath the dried poultice paste to remove. Discard the paste materials. Wipe your surface with a damp cloth and dry with another cloth.